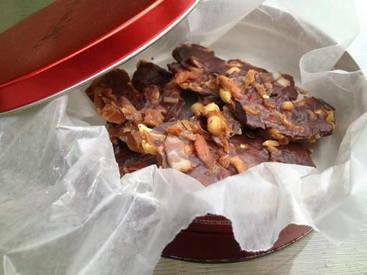 If you’re looking for something new to make in your kitchen and give as gifts this Christmas season, this peanut-bacon-chocolate toffee is a great one. With its combination of sweet and salty and a little smoky flavors encased in crunch, it’s a winner. Just be sure it’s labeled so no unsuspecting vegetarians take a piece. Also let your recipients know it should be refrigerated.